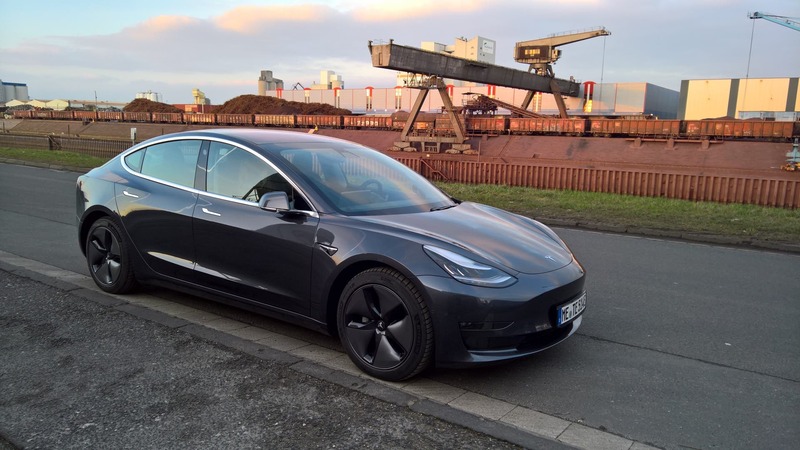 The Tesla Model 3 is blitzing China with a full-frontal assault that has boatloads of vehicles arriving every couple of days in a push to maximize the number of vehicles shipped to the country before Trump throws another hissy and restarts the trade war. The “Morning Cindy” arrived in Shanghai on February 22nd to offload her stock of 1,600 Model 3s. Just two days later, the “Emerald Ace” arrived in Tianjin with more Model 3s and is being offloaded as I write this. To further stoke the flames of excitement, Tesla has put on Model 3 Experience Days in Beijing that give customers an opportunity to ride in the passenger seat of a Tesla Model 3 with a professional driver who showcases the car and its capabilities. The event was hosted at the Beijing Goldenport International Circuit and the video below shows just how much fun this car is when pushed to its limits. To convert that excitement into sales, Tesla has been running a special promotion that gives new owners its Enhanced Autopilot solution free of charge, with a deadline of March 1st to get your orders in. To get the vehicles into the hands of customers, Tesla has launched its vehicle delivery service in China, allowing customers to take delivery of their new vehicle from the comfort of their own home. The service has been up and running in the US for several months now, and it is exciting to see the program scaling up for overseas customers. The wave of vehicles coming into the country serves to satisfy existing orders for the vehicle and get more vehicles into the country before the trade war between the US and China escalates again. The Cheeto in charge tweeted out that he was delaying the increase in tariffs on China that was previously planned for March 1st, giving Tesla more time to flood the country with goods before the inevitable escalation. In parallel, Tesla continues to push forward with construction at its Gigafactory 3 in Shanghai. A new video from February 24th shows scores of diesel-powered pile drivers sending foundational supports into the ground and thick pollution up into the air. The rapid speed at which China is able to put a building up clearly comes at a steeper cost to the environment than in California, where any change to the paint shop, paving a parking lot, or even using a street sweeper are all highly regulated by the California Air Resources Board. To ensure that customer vehicles are able to be serviced, Tesla has rolled out a fleet of mobile service vehicles to support the flood of new EV drivers in China. Some of the fleet is using Model S service vehicles — though, they are clearly overpriced for the task. A fleet of Tesla Model Y service vehicles at their lower price point and more compact footprint would be much better suited to the job, but it is still exciting to see Tesla scaling its mobile service fleet into China. According to Tesla CEO Elon Musk, the company is not thinking about stoking demand at all and is instead ramping up its existing offerings to new customers in China and Europe. Back at home in the US, Tesla continues to squeeze out every last penny of cost from the Model 3 in its quest to deliver a $35,000 Standard Range Model 3. Some of those cuts come from the interior changing from the Premium Interior to the Standard Interior package, but much of the cost cut is expected to come from the battery pack. Is there another $9,000 to save from the battery? We don’t know, but we do know that the effort to cut costs has taken longer than Tesla expected it to. This feels a lot like “Elon time,” where he can logically see the connections and the path to a lower-cost vehicle, but the actual effort required to cut cost and build that more affordable vehicle is more arduous than it seemed at first.